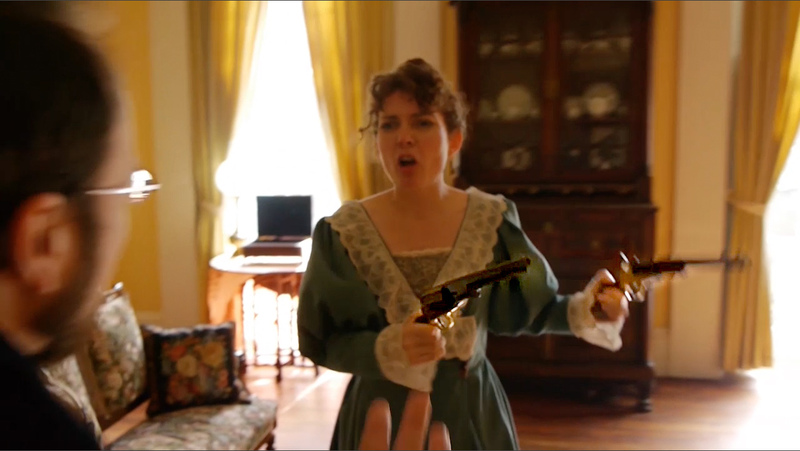 In the play, Hedda Gabler just takes one pistol from the display case during her fight with George. While making the movie I thought "we have two pistols, and she SAYS 'pistol*S*' with an 's' -- so let's have her take both. And then we spent an afternoon dealing with all the butterfly effects that caused, from how does she now open and close doors with a pistol in each hand? And "how do we get that other pistol back in the box where Judge Brack has already found it in a scene we shot yesterday"? Ultimately though, this scene works better for the pair, but I realize the problems of capricious changes to the storyline. General Gabbler's Pistols. You may clickenzee to embiggen! .... and I'm, like, "what is a cat going to do with a pistol? ... ... ... oh. THAT Judge Brack."